A diving regulator is a pressure regulator used in scuba or surface supplied diving equipment that reduces pressurized breathing gas to ambient pressure and delivers it to the diver. The gas may be air or one of a variety of specially blended breathing gases. The gas may be supplied from a cylinder worn by the diver (as in a scuba set) or via a hose from a compressor or a bank of cylinders on the surface (as in surface-supplied diving). A gas pressure regulator has one or more valves in series which reduce pressure from the source, and use the downstream pressure as feedback to control the delivered pressure, lowering the pressure at each stage. The terms "regulator" and "demand valve" are often used interchangeably, but a demand valve is the part of a regulator that delivers gas only while the diver is breathing in and reduces the gas pressure to ambient. In single hose regulators, the demand valve is part of the second stage, which is held in the diver's mouth by a mouthpiece. In double hose regulators the demand valve is part of the regulator attached to the cylinder. For the history of the diving regulator, see Timeline of diving technology and Scuba set. A demand valve detects when the diver starts inhaling and supplies the diver with a breath of gas at ambient pressure. The demand valve was invented in 1838 in France and forgotten in the next few years; another workable demand valve was not invented until 1860. On November 14, 1838, Dr. Manuel Théodore Guillaumet of Argentan, Normandy, France, filed a patent for a twin-hose demand regulator; the diver was provided air through pipes from the surface. The apparatus was demonstrated to and investigated by a committee of the French Academy of Sciences: "Mécanique appliquée -- Rapport sur une cloche à plongeur inventée par M. Guillaumet" (Applied mechanics—Report on a diving bell invented by Mr. Guillaumet), Comptes rendus, vol. 9, pages 363-366 (September 16, 1839). Illustration of diving apparatus invented by Dr. Manuel Théodore Guillaumet from: Alain Perrier, 250 Réponses aux questions du plongeur curieux [250 Answers to the questions of the curious diver] (Aix-en-Provence, France: Éditions du Gerfaut, 2008), page 45. In 1860 a mining engineer from Espalion (France), Benoît Rouquayrol, invented a demand valve with an iron air reservoir to let miners breathe in flooded mines. He called his invention régulateur ('regulator'). In 1864 Rouquayol met the French Imperial Navy officer Auguste Denayrouze and they worked together to adapt Rouquayrol's regulator to diving. The Rouquayrol-Denayrouze apparatus was mass-produced with some interruptions from 1864 to 1965. As of 1865 it was acquired as a standard by the French Imperial Navy, but never was entirely accepted by the French divers because of a lack of safety and autonomy. In 1926 Maurice Fernez and Yves Le Prieur patented a hand-controlled regulator (not a demand valve), which used a full-face mask (the air escaping from the mask at constant flow). It was not until December 1942 that the demand valve was definitely improved in the way we know nowadays. This came about when Frenchmen Jacques-Yves Cousteau (navy officer) and Émile Gagnan (engineer) met for the first time in Paris. Gagnan, employee at Air Liquide, had miniaturized and adapted a Rouquayrol-Denayrouze regulator used for gas generators (following severe fuel restrictions due to the German occupation of France); Cousteau suggested it be adapted for diving, which in 1864 was its original purpose. Smaller than the large Rouquayrol-Denayrouze regulator and equipped with a safer reservoir (three gas cylinders at the time,) the modern demand valve was born. Another French inventor, Georges Commeinhes from Alsace, had patented in 1937 and 1942 a diving demand valve air-supplied by two gas cylinders through a full-face mask. Commeinhes died in 1944 during the liberation of Strasbourg and his invention was soon forgotten. In any case, the Commeinhes demand valve was also an adaptation of the Rouquayoul-Denayrouze mechanism, but not as precise and miniaturized as was the Cousteau-Gagnan apparatus. The demand valve has a chamber, which in normal use contains breathing gas at ambient pressure. A valve which supplies medium pressure gas can vent into the chamber. Either a mouthpiece or a full-face mask is connected to the chamber for the diver to breathe from. On one side of the chamber is a flexible diaphragm to control the operation of the valve. Modern demand valves use both breathing systems, mouthpiece or full-face mask, depending on the purpose of the dive. Full-face masks allow the use of underwater communication systems (usually called intercoms). Historically old demand valves also used one or the other system: the 1838 Guillaumet, 1864 Rouquayrol-Denayrouze, 1926 Fernez-Le Prieur, and 1943 Cousteau-Gagnan apparatuses used mouthpieces to provide the air to the diver (although the 1838 Guillaumet's demand valve was not independent from the surface and the Fernez-Le Prieur patent was not a demand valve). The 1933 Le Prieur and 1942 Commeinhes apparatuses used full-face masks. When the diver starts to breathe in, the inhalation lowers the pressure inside the chamber, which moves the diaphragm inwards operating a system of levers. This operates against the closing spring and lifts the valve off its seat, opening the valve and releasing gas into the chamber. The medium pressure gas, at about 10 bar/140 psi over ambient pressure, expands reducing its pressure to ambient pressure blowing out any water in the chamber and supplying the diver with gas to breathe. When the chamber is full and the lowering of pressure has been reversed, the diaphragm expands outwards to its normal position to close the medium pressure valve when the diver stops breathing in. When the diver exhales, one-way valves (made from a flexible air-tight material) flex outwards under the pressure of the exhalation letting gas escape from the chamber. They close, making a seal, when the exhalation stops and the pressure inside the chamber reduces to ambient pressure. The diaphragm is protected by a cover with holes or slits through which outside water can enter freely. Demand valves can be either an open circuit valve or a reclaim valve. The vast majority of demand valves are open circuit, which means that the exhaled gas is discharged into the surrounding environment and lost. Reclaim valves allow the used gas to be returned to the surface or (more often) diving bell for reuse after removing the carbon dioxide and making up the oxygen. This process referred to as "push-pull" is technologically complex and expensive and is only used for deep commercial diving on heliox mixtures, as the saving on helium compensates for the expense and complications of the system. These are generally used in surface supply diving with free-flow masks and helmets. They are usually a large high-flow rated industrial gas regulator that is manually controlled at the gas panel on the surface to the pressure required to provide the desired flow rate to the diver. Free flow is not normally used on scuba equipment as the high gas flow rates are inefficient and wasteful. Rebreather systems used for diving also recycle the breathing gas, but are not based on a demand valve system for their primary function. Instead, the breathing loop is carried by the diver and remains at ambient pressure while in use. Regulators used in scuba rebreathers are described below. These are used in rebreathers to add gas to the loop to compensate automatically for volume reduction due to pressure increase with greater depth or to make up gas lost from the system by the diver exhaling through the nose while clearing the mask or as a method of flushing the loop. They are often provided with a purge button to allow manual flushing of the loop. The ADV is virtually identical in function to the open circuit demand valve. Some passive semi-closed circuit rebreathers use the ADV to add gas to the loop to compensate for a portion of the gas discharged automatically during the breathing cycle as a way of maintaining a suitable oxygen concentration. This is an open circuit demand valve built into a rebreather mouthpiece or other part of the breathing loop. It can be isolated while the diver is using the rebreather to recycle breathing gas and opened at the same time as isolating the breathing loop when a problem causes the diver to bail out onto open circuit. The main distinguishing feature of the BOV is that the same mouthpiece is used for open and closed-circuit, and the diver does not have to shut the Dive/Surface valve, remove it from his/her mouth, and find and insert the bailout demand valve in order to bail out onto open circuit. Although costly, this reduction in critical steps makes the integrated BOV a significant safety advantage. These are used to supply a constant mass flow of fresh gas to an active type semi-closed rebreather to replenish the gas used by the diver and to maintain an approximately constant composition of the loop mix. Two main types are used: the fixed orifice and the adjustable orifice (usually a needle valve). The constant mass flow valve is usually based on a gas regulator that is isolated from the ambient pressure so that it provides an absolute pressure regulated output (not compensated for ambient pressure). This limits the depth range in which constant mass flow is possible through the orifice, but provides a relatively predictable gas mixture in the breathing loop. An overpressure valve is used to protect the output hose. The parts of a regulator are described as the major functional groups in downstream order as following the gas flow from the cylinder to its final use and accessories that are not part of the primary functional components but are commonly found on contemporary regulators. Some historically interesting models and components are described in a later section. Most contemporary diving regulators are single-hose two-stage regulators. They consist of a first-stage regulator, and a second-stage demand valve. An intermediate-pressure hose connects these components to transfer air, and allows relative movement within the constraints of hose length and flexibility. Other medium pressure hoses run to various equipment listed below. The first make of this sort of scuba was the Porpoise which was made in Australia and was invented by Ted Eldred. At the same time in France, the Cristal Explorer (single hose) was designed by Bronnec & Gauthier. The first stage of the regulator is mounted to the cylinder valve via one of the standard connectors. It reduces cylinder pressure to a middle or intermediate pressure, usually about Script error: No such module "convert". higher than the ambient pressure. The breathing gas then passes through a hose to the second stage. A balanced regulator first stage automatically keeps a constant pressure difference between the interstage pressure and the ambient pressure even as the tank pressure drops with consumption. The balanced regulator design allows the first stage orifice to be as large as needed without incurring performance degradation as a result of changing tank pressure. The first stage generally has several low-pressure outlets (ports) for second-stage regulators, BCD inflators and other equipment; and one or more high-pressure outlets, which allow a submersible pressure gauge (SPG) or gas-integrated diving computer to read the cylinder pressure. The valve may be designed so that one low-pressure port is designated "Reg" for the primary second stage regulator, because that port allows a higher flow rate to give less breathing effort at maximum demand. A small number of manufacturers have produced regulators with a larger than standard hose and port diameter for this primary outlet. The mechanism inside the first stage can be of the diaphragm type or the piston type. Both types can be balanced or unbalanced. Unbalanced regulators have the cylinder pressure pushing the first stage upstream valve closed, which is opposed by the intermediate stage pressure and a spring. As cylinder pressure falls the closing force is less, so the regulated pressure increases at lower tank pressure. To keep this pressure rise within acceptable limits the high-pressure orifice size was limited, but this decreased the total flow capacity of the regulator. A balanced regulator keeps about the same ease of breathing at all depths and pressures, by using the cylinder pressure to also indirectly oppose the opening of the first stage valve. An improvement to the standard first stage has been made by Mares (scuba gear company) called DFC (Dynamic Flow Control) - The DFC system (Mares patented) minimizes the pressure drop that occurs in all regulator first stages when the diver inhales. The DFC system uses the Venturi Effect, optimizing the regulator's sensitivity and minimizing inhalation resistance, especially during dives in extreme conditions. Some components of piston-type first stages are easier to manufacture and have a simpler design than the diaphragm type. They need more careful maintenance because some internal moving parts are exposed to water and any contaminants in the water. The piston in the first stage is rigid and acts directly on the seat of the valve. The pressure in the medium (aka intermediate) pressure chamber drops when the diver inhales from the second stage valve, this causes the piston to lift off the stationary valve seat as the piston slides into the intermediate pressure chamber. The now open valve permits high pressure gas to flow into the medium pressure chamber until the pressure in the chamber has risen enough to push the piston back into its original position against the seat and thus close the valve. Diaphragm-type first stages are more complex and have more components than the piston type. Their design makes them particularly suited to cold water diving and to working in saltwater and water containing a high degree of suspended particles, silt, or other contaminating materials, since the only parts exposed to the water are the valve opening spring and the diaphragm, all other parts are sealed off from the environment. In some cases the diaphragm and spring are also sealed from the environment. The diaphragm is a flexible cover to the medium (intermediate) pressure chamber. When the diver consumes gas from the second stage, the pressure falls in the medium pressure chamber and the diaphragm deforms inwards pushing against the valve lifter. This opens the high pressure valve permitting gas to flow past the valve seat into the medium-pressure chamber. When the diver stops inhaling, pressure in the medium pressure chambers rises and the diaphragm returns to its neutral flat position and no longer presses on the valve lifter shutting off the flow until the next breath is taken. In an open circuit scuba set, the first-stage of the regulator has an A-clamp, also known as a yoke or international connection, or a DIN fitting to connect it to the pillar valve of the diving cylinder. There are also European standards for scuba regulator connectors for gases other than air. Yoke valves (sometimes called A-clamps from their shape) are the most popular in North America and many countries with many recreational diving tourists; it clamps an open hole on the regulator against an open hole on the cylinder. The user screws the clamp in place finger-tight, and once the cylinder valve is opened, gas pressure completes the seal along with an O-ring. The diver must take care not to screw the yoke down too tightly, or it may prove impossible to remove without tools. Conversely, failing to tighten sufficiently can lead to O-ring extrusion and a loss of cylinder gas, which can be a serious problem if it happens when the diver is at depth. Yoke fittings are rated up to a maximum of 240 bar working pressure. The DIN fitting is a type of direct screw-in connection to the cylinder. The DIN system, is less common worldwide, but has the advantage of withstanding greater pressure, up to 300 bar, allowing use of high-pressure steel cylinders. They are less susceptible to blowing the O-ring seal if banged against something. DIN fittings are the standard in much of central Europe and are available in most countries. The DIN fitting is considered more secure and therefore safer by many technical divers. Adapters are available enabling a DIN first-stage to be attached to a cylinder with a yoke fitting valve, and for a yoke first stage to be attached to a DIN cylinder valve. Most cylinder valves are currently of the K-valve type, which is a simple manually operated screw-down on-off valve. In the mid-1960s, J-valves were widespread. J-valves contain a spring-operated valve that is restricts or shuts off flow when tank pressure falls to 300-500 psi, causing breathing resistance and warning the diver that he or she is dangerously low on air. The reserve air is released by pulling a reserve lever on the valve. J-valves fell out of favor with the introduction of pressure gauges, which allow divers to keep track of their air underwater, especially as the valve-type is vulnerable to accidental release of reserve air and increases the cost and servicing of the valve. J-valves are occasionally still used when work is done in visibility so poor that the pressure gauge cannot be seen, even with a light. As gas leaves the cylinder it decreases in pressure in the first stage, becoming very cold due to adiabatic expansion. Where the ambient water temperature is less than 5 °C any water in contact with the regulator may freeze. If this ice jams the diaphragm or piston spring, preventing the valve closing, a free-flow may ensue that can empty a full cylinder within a minute or two, and the free-flow causes further cooling in a positive feedback loop. Generally the water that freezes is in the ambient pressure chamber around a spring that keeps the valve open and not moisture in the breathing gas from the cylinder, but that is also possible if the air is not adequately filtered. The modern trend of using more plastics, instead of metals, in regulators encourages freezing because it insulates the inside of a cold regulator from the warmer surrounding water. Cold water kits can be used to reduce the risk of freezing inside the regulator. Some regulators come with this as standard, and some others can be retrofitted. Environmental sealing of the diaphragm main spring chamber using a soft secondary diaphragm and hydrostatic transmitter or a silicone, alcohol or glycol/water mixture antifreeze liquid in the sealed spring compartment can be used for a diaphragm regulator. Silicone grease in the spring chamber can be used on a piston first stage. The Poseidon Xstream first stage insulates the external spring and spring housing from the rest of the regulator, so that it is less chilled by the expanding air, and provides large slots in the housing so that the spring can be warmed by the water, thus avoiding the problem of freezing up the external spring. A medium (intermediate) pressure hose is used to allow breathing gas (typically at between 9 and 13 atmospheres above ambient) to flow from the first stage regulator to the second stage, or demand valve, which is held in the mouth by the diver, or attached to the full face mask or diving helmet. The "twin", "double" or "two" hose type of scuba demand valve was the first in general use. This type of regulator has two large bore corrugated breathing tubes. One tube is to supply air from the regulator to the mouthpiece, and the second tube is for exhalation; it is not for rebreathing but to keep the air inside the breathing tube at the same pressure as the water at the regulator diaphragm. This second breathing tube returns the exhaled air to the regulator on the wet side of the diaphragm, where it is released through a rubber duck-bill one-way valve, and comes out of the holes in the cover. In Cousteau's original aqualung prototype, there was no exhaust hose, and the exhaled air exited through a one-way valve at the mouthpiece. It worked out of water, but when he tested the aqualung in the river Marne air escaped from the regulator before it could be breathed when the mouthpiece was above the regulator. After that, he had the second breathing tube fitted. Even with both tubes fitted, raising the mouthpiece above the regulator increases the flow of gas and lowering the mouthpiece increases breathing resistance. As a result, many aqualung divers, when they were snorkeling on the surface to save air while reaching the dive site, put the loop of hoses under an arm to avoid the mouthpiece floating up causing free flow. Diver orientation changes breathing characteristic of regulators. With twin hose regulator on back at shoulder level, if the diver rolls on his or her back the released air pressure is higher than in the lungs. Divers learned to restrict flow by using their tongue to close the mouthpiece. When the cylinder pressure was running low and air demand effort rising, a roll to the right side made breathing easier. Divers had to carry more weight underwater to compensate for the buoyancy of the air in the hoses. An advantage with this type of regulator is that the bubbles leave the regulator behind the diver's head, increasing visibility, and not interfering with underwater photography. Twin hose regulators have been superseded by single hose regulators and became obsolete for most diving in the 1980s. Some modern twin-hose regulators have one or more low-pressure ports that branch off between the two valve stages, which can be used to supply direct feeds for suit or BC inflation and/or a secondary single hose demand valve, and a high pressure port for a submersible pressure gauge. Someone made a twin-hose type regulator where the energy released as the air expands from cylinder pressure to the surrounding pressure as the diver breathes in, is not thrown away but used to power a propeller. 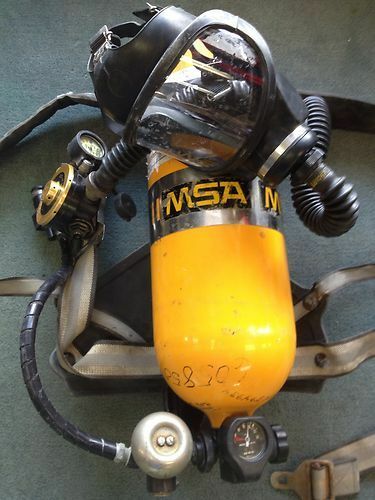 The twin-hose arrangement with a mouthpiece or full-face mask has reappeared in modern rebreathers, but as part of the breathing loop, not as part of a regulator. The associated demand valve comprising the bail-out valve is always a single hose regulator. Nemrod twin-hose regulator made in the 1980s. It has one low-pressure port, which feeds the left (inhalation) hose. Its mouthpiece can be strapped in. Early open circuit scuba demand regulators were mostly twin hose designs. The mechanism of the regulator is packaged in a usually circular metal housing mounted on the cylinder valve behind the diver's neck, and the air flows through a pair of corrugated rubber hoses to and from the mouthpiece. The supply hose is connected to one side of the regulator body and supplies air to the mouthpiece through a non-return valve, and the exhaled air is returned to the regulator housing on the outside of the diaphragm, also through a non-return valve on the other side of the mouthpiece and usually through another non-return exhaust valve in the regulator housing - often a "duckbill" type. The demand valve component of a two-stage twin hose regulator is thus mounted in the same housing as the first stage regulator, and in order to prevent free-flow, the exhaust valve is located at the same depth as the diaphragm, and the only reliable place to do this is in the same housing. Some early twin hose regulators were of single-stage design. The first stage functions in a way similar to the second stage of two-stage demand valves, but would be connected directly to the cylinder valve and reduced high pressure air from the cylinder directly to ambient pressure on demand. This could be done by using a longer lever and larger diameter diaphragm to control the valve movement, but there was a tendency for cracking pressure, and thus work of breathing, to vary as the cylinder pressure dropped. Most modern demand valves use a downstream rather than an upstream valve mechanism. In a downstream valve, the moving part of the valve opens in the same direction as the flow of gas and is kept closed by a spring. In an upstream valve, the moving part works against the pressure and opens in the opposite direction as the flow of gas. If the first stage jams open and the medium pressure system over-pressurizes, the second stage downstream valve opens automatically resulting in a "freeflow". With an upstream valve, the result of over-pressurization may be a blocked valve. This will stop the supply of breathing gas and possibly result in a ruptured hose or the failure of another second stage valve, such as one that inflates a buoyancy device. When a second stage upstream tilt valve is used a relief valve should be included by the manufacture on the first stage regulator to protect the intermediate hose. If a shut-off valve is fitted between the first and second stages, as is found on scuba bailout systems used for commercial diving and in some technical diving configurations, the demand valve will normally be isolated and unable to function as a relief valve. In this case an overpressure valve must be fitted to the first stage if it does not already have one. As very few contemporary (2011) scuba regulator first stages are factory fitted with overpressure relief valves, they are available as aftermarket accessories which can be screwed into any low pressure port available on the first stage. A downstream demand valve serves as a fail safe for over-pressurization: if a first stage with a demand valve malfunctions and jams in the open position, the demand valve will be over-pressurized and will "free flow". Although it presents the diver with an imminent "out of air" crisis, this failure mode lets gas escape directly into the water without inflating buoyancy devices. The effect of unintentional inflation might be to carry the diver quickly to the surface causing the various injuries that can result from an over-fast ascent. There are circumstances where regulators are connected to inflatable equipment such as a rebreather's breathing bag, a buoyancy compensator, or a drysuit, but without the need for demand valves. Examples of this are argon suit inflation sets and "off board" or secondary diluent cylinders for closed-circuit rebreathers. When no demand valve is connected to a regulator, it should be equipped with a pressure relief valve, unless it has a built in over pressure valve, so that over-pressurization does not inflate any buoyancy devices connected to the regulator. This is an analog gauge that can be held in the palm of a hand and is connected to the first stage by a high pressure hose. It displays with a pointer moving over a dial. Sometimes they are fixed in a console, which is a plastic or rubber case that holds the air pressure gauge and also a depth gauge and/or a dive computer and/or a compass. These are coin-sized analog pressure gauges located on the first stage. They are compact, have no dangling hoses, and few points of failure. They are generally not used on back mounted cylinders because the diver cannot easily see them there when underwater. They are sometimes used on side slung stage cylinders. Due to their small size, it can be difficult to read the gauge to a resolution of less than 20 bar / 300 psi. Some dive computers are designed to measure, display, and monitor pressure in the diving cylinder. This can be very beneficial to the diver, but if the dive computer fails the diver can no longer monitor his or her gas reserves. Most divers using a gas-integrated computer will also have a standard air pressure gauge. The computer is either connected to the first stage by a high pressure hose, or has two parts - the pressure transducer on the first stage and the display at the wrist or console, which communicate by radio link; the signals are encoded to eliminate the risk of one diver's computer picking up a signal from another diver's transducer or radio interference from other sources. In the past, some types of diving cylinder had a mechanical reserve valve that restricted air flow when the pressure was below 500 psi. Alerted to having a low gas supply the diver would pull a lever to open the reserve valve and surface using the reserve gas. Occasionally, a diver would inadvertently trigger the mechanism while putting his or her gear on or moving underwater and, unaware that the reserve had already been accessed, could find himself or herself out of breathing gas with no warning. These valves are known as "J valves" due to the letter J being next to that sort of valve in the US Divers product catalog. Valves without the reserve lever are called "K valves" for the same reason; being the next item in the catalog they were denoted by the letter K. Modern divers using "J valves" dive with the reserve valve in the open position and depend on a contents gauge or computer to monitor gas supply. Or see Scuba set#Secondary demand valve on a regulator. As a nearly universal standard practice in modern recreational diving, the typical single-hose regulator has a spare demand valve fitted for emergency use by the diver's buddy, typically referred to as the octopus because of the extra hose, or secondary demand valve. The octopus was invented by Dave Woodward at UNEXSO around 1965-6 to support the free dive attempts of Jacques Mayol. Woodward believed that having the safety divers carry two second stages would be a safer and more practical approach than buddy breathing in the event of an emergency. The medium pressure hose on the octopus is usually longer than the medium pressure hose on the primary demand valve that the diver uses, and the demand valve and/or hose may be colored yellow to aid in locating in an emergency. The secondary regulator should be clipped to the diver's harness in a position where it can be easily seen and reached by both the diver and the potential sharer of air. The longer hose is used for convenience when sharing air, so that the divers are not forced to stay in an awkward position relative to each other. Technical divers frequently extend this feature and use a 5-foot or 7-foot hose, which allows divers to swim in single file while sharing air, which may be necessary in restricted spaces inside wrecks or caves. The secondary demand valve can be a hybrid of a demand valve and a buoyancy compensator inflation valve. Both types are sometimes called alternate air sources. When the secondary demand valve is integrated with the buoyancy compensator inflation valve, since the inflation valve hose is short (usually just long enough to reach mid-chest), in the event of a diver running out of air, the diver with air remaining would give his or her primary second stage to the out-of-air diver, and switch to the inflation valve himself. A demand valve on a regulator connected to a separate independent diving cylinder would also be called an alternate air source and also a redundant air source, as it is totally independent of the primary air source. This is stretching the concept of accessory a bit, as it would be equally valid to call the regulator an accessory of the full face mask or helmet, but the two items are closely connected and generally found in use together. Most full face masks and probably most diving helmets currently in use are open circuit demand systems, using a demand valve (in some cases more than one) and supplied from a scuba regulator and frequently also a surface supply umbilical from a surface supply panel using a surface supply regulator to control the pressure of primary and reserve air or other breathing gas. Lightweight diving helmets are almost always surface supplied, but full face masks are used equally appropriately with scuba open circuit, scuba closed circuit (rebreathers), and surface supplied open circuit. The demand valve is usually firmly attached to the helmet or mask, but there are a few models of full face mask that have removable demand valves with quick connections allowing them to be exchanged under water. These include the Draeger Panorama and Kirby-Morgan 48 Supermask. A drysuit direct feed a.k.a. a power inflator. CEJN 221 type. Hoses may be fitted to low pressure ports of the regulator first stage to provide gas for inflating buoyancy compensators and/or dry suits. These hoses usually have quick-connector end with an automatically sealing valve which blocks flow if the hose is disconnected from the BC or suit. There are two basic styles of connector, which are not compatible with each other. The high flow rate fitting has a larger bore and allows gas flow at a fast enough rate for use as a connector to a demand valve. This is sometimes seen in a combination BC inflator/deflator mechanism with integrated secondary DV (octopus), such as in the AIR II unit from Scubapro. The low flow rate connector is more common and is the industry standard for BC inflator connectors, and is also popular on dry suits, as the limited flow rate reduces the risk of a blow-up if the valve sticks open. The high flow rate connector is used by some manufacturers on dry suits. Various minor accessories are available to fit these hose connectors. These include interstage pressure gauges, which are used to troubleshoot and tune the regulator (not for use underwater), noisemakers, used to attract attention underwater and on the surface, and valves for inflating tires and inflatable boat floats, making the air in a scuba cylinder available for other purposes. These are usually rubber or tough plastic moldings which enclose the SPG and have mounting sockets for other diver instrumentation, such as decompression computers, underwater compass, timer and/or depth gauge and occasionally a small plastic slate on which notes can be written either before or during the dive. There instruments would otherwise be carried somewhere else such as strapped to the wrist or forearm or in a pocket and are only regulator accessories for convenience of transport and access. This type is mentioned here because it is very familiar in comics and other drawings, as a wrongly drawn twin-hose two-cylinder aqualung, with one wide hose coming out of each cylinder top with no apparent regulator valve and going to the mouthpiece, much more often than a correctly drawn twin-hose regulator: see Frogman#Drawing and artwork. It would not work in the real world. 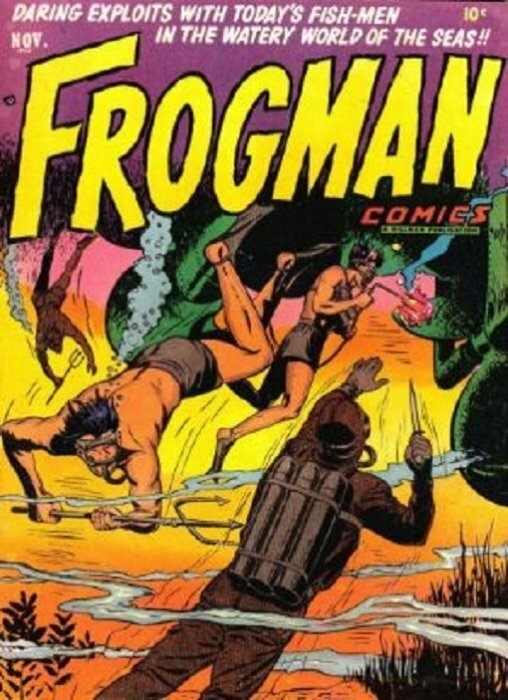 Front page of a comic, with a back view of a diver with a 3-cylindered twin-hose air scuba (aqualung) showing this drawing error. Here the cylinder(s) are on the diver's back and are connected by an intermediate-pressure hose to a twin-hose regulator on the diver's chest. A design described in Practical Mechanics magazine in January 1955 as a home-made aqualung with a first-stage on the cylinder top leading through an intermediate-pressure hose to a large round second-stage (a converted Calor Gas regulator) on the diver's chest connected to the diver's mouthpiece by a twin-hose loop. An old Australian make called a Lawson Lung: image in the page at this link. In 1956 and for some years afterwards in Britain, factory-made aqualungs were very expensive. Many aqualungs of this type were made by sport divers in diving clubs' workshops using miscellaneous industrial and war-surplus parts. One necessary raw material was a Calor Gas bottled butane gas regulator. The 1950s version was like an aqualung regulator's second stage, but operated constant-flow because its diaphragm was spring-loaded. Conversion included changing the spring and making several big holes in the wet-side casing. The cylinder was often an ex-RAF pilot's oxygen cylinder. Some of these cylinders were called tadpoles due to their shape. In least one version of Russian twin-hose aqualung, the regulator did not have an A-clamp but instead screwed into a large socket on the cylinder manifold; that manifold was thin and meandered somewhat. It had two cylinders and a pressure gauge. There is suspicion that those Russian aqualungs started as a factory-made improved descendant of an aqualung home-made by British sport divers and obtained unofficially by a Russian and taken to Russia. For a few years in the mid-1950s, Draeger made the Draeger Delphin II (their first scuba regulator - it was marketed as the Barakuda (now IAC) in the USA): this was a "twin-hose" regulator with the left hose only: the exhaled air went back down the left hose to the "dry" side of the diaphragm and was released to outside through a one-way valve inside the casing. The end of the flexible tube was connected to the mouthpiece by a short quarter-circle of hard tube. It would have caused dead space similarly to a rebreather with a pendulum system. For an industrial breathing set for use only out of water, it is possible to have no exhalant tube but to release the exhaled breath at the user's head: example at this link. In constant-flow regulators the first stage is a pressure regulator providing a constant reduced pressure, and the second stage is a plain on/off valve. These are the earliest type of breathing set flow control. The diver must open and close the supply valve to regulate flow. Constant flow valves in an open circuit breathing set consume gas less economically than demand valve regulators because gas flows even when it is not needed. "Ohgushi's Peerless Respirator". The valve was operated by the diver's teeth. Commandant le Prieur's breathing sets: see Timeline of underwater technology. They were used for some sport diving on the French Riviera. Sometimes, to economize on air, the cylinder blew into a bag (not a rebreathing bag), where it accumulated until the bag became full or the diver breathed in from the bag. Several versions of the Le Prieur breathing set. Yves Le Prieur first patented with Maurice Fernez, in 1926, a breathing apparatus using a mouthpiece, but as of 1933 he removed the mouthpiece and included a circular full-face mask in all following patents (like 1937, 1946 or 1947). In 1934 René Commeinhes, from Alsace (France), adapted a Rouquayrol-Denayrouze apparatus for the use of firefighters. With new 1937 and 1942 patents (GC37 and GC42), his son Georges adapted this invention to underwater breathing by means of a single hose connected to a full-face mask. Captain Trevor Hampton invented independently from Le Prieur a similar regulator-mask in the 1950s and submitted it for patent. The Royal Navy requisitioned the patent, but found no use for it and eventually released it. By then, the market had moved on and it was too late to make this regulator-mask in bulk for sale. In Europe, EN250:2000 defines the minimum requirements for breathing performance of regulators. The original Cousteau twin-hose diving regulators could deliver about 140 litres of air per minute and that was officially thought to be adequate, but divers sometimes needed a faster rate and had to learn not to "beat the lung", i.e. to breathe faster than the regulator could supply. Between 1948 and 1952 Ted Eldred designed his Porpoise air scuba to supply 300 liters/minute if the diver needed to breathe that fast. That soon became British and Australian naval standard. In the United States Military, scuba regulators must adhere to performance specifications as outlined by the Mil-R-24169B, which was based on equipment performance until recently. Various breathing machines have been developed and used for assessment of breathing apparatus performance. ANSTI has developed a testing machine that measures the inhalation and exhalation effort in using a regulator. Publishing results of the performance of regulators in the ANSTI test machine has resulted in big performance improvements. Sheck Exley, for purposes of rescue during cave diving, Exley helped standardize the usage of the "octopus"
^ Avec ou sans bulles ? (With or without bubbles? ), an article (in French) by Eric Bahuet, published in the specialized website plongeesout.com. ^ Clarke, John (2015). "Authorized for cold-water service: What Divers Should Know About Extreme Cold". ECO Magazine: 20–25. Retrieved 2015-03-07. ^ a b Fred M. Roberts, 1963, Basic Scuba. Self-Contained Underwater Breathing Apparatus: Its Operation, Maintenance and Use. Enlarged 2nd ed. Van Nostrand Reinhold Co. New York. ^ Middleton, JR (1980). "Evaluation of Commercially Available Open Circuit Scuba Regulators". United States Navy Experimental Diving Unit Technical Report. NEDU-2-80. Retrieved 2008-06-12. ^ Morson, PD (1987). "Evaluation of Commercially Available Open Circuit Scuba Regulators". United States Navy Experimental Diving Unit Technical Report. NEDU-8-87. Retrieved 2008-06-12. ^ Warkander, DE (2007). "Comprehensive Performance Limits for Divers' Underwater Breathing Gear: Consequences of Adopting Diver-Focused Limits". United States Navy Experimental Diving Unit Technical Report. NEDU-TR-07-02. Retrieved 2008-06-12. ^ Reimers, SD (1973). "Performance Characteristics and Basic Design Features of a Breathing Machine for Use to Depths of up to 3000 Feet of Sea Water". United States Navy Experimental Diving Unit. NEDU-20-73. Retrieved 2008-06-12. ^ "The ANSTI Machine: Evaluating A Regulator's Breathing Characteristics - Scuba Diving Magazine". Regulators reviews by Scuba Diving magazine. Regulators: individual reviews by Divernet magazine. Regulators: group reviews by Divernet magazine.